Info Tod Robinson Caldwell (19 February 1818 -- 11 July 1874) was a lawyer and the Republican governor of the U.S. state of North Carolina from 1871 to 1874. He was born in Morganton, North Carolina. He lived in Burke County. 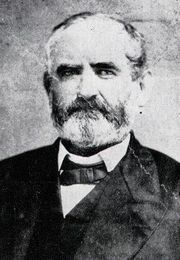 Caldwell attended the University of North Carolina at Chapel Hill, was solicitor for Burke County. NC State Senate (W-Burke County) 1850-1851. Lt. Governor (R-NC) 1868-1870. Elected the first Lieutenant Governor of NC and the first of only four Republicans to serve in that post. When Gov. Holden was impeached from office for taking action to quell the Ku Klux Klan, Caldwell succeeded to the governorship (12/15/1870). The office of Lt. Governor remained vacant until 1873. Governor (R-NC) 1870-1874. Second of six Republicans to serve as NC Governor. Re-elected in 1872 in a close race with Augustus S. Merrimon, the Conservative Party nominee. Three main issues dominated Caldwell's tenure as Governor. The first was the rise of the Klan, which he was mostly powerless to combat. The legislature, which was controlled by the Conservative Party, repealed laws used against the Klan and restricted the Governor's ability to respond to Klan atrocities.